Lots of new projects and startups are coming into the crypto space. Right now, more than 10 ICOs are running at the same time, and every day we see more and more coming. It is very important to focus on the planification and procedures of everything related to blockchain technology when we want to start a new project. The money and confidence of thousands of investors is one of the most difficult things to achieve in this early stage, and The DAO incident is still present in the minds of every single member of the ecosystem. Every entrepreneur in the world knows how difficult is to run a startup, and one of the most important things to have in mind is that the confidence of the clients is really difficult to achieve and really easy is to lose, and this behavior is even more accentuated in our sector. The blockchain ecosystem has long had massive software catastrophes one after another, and this is probably one of the reasons for its slowed expansion. Because of this, we need now, more than ever, a development framework which lets us build robust applications with the highest level of security possible. Nowadays, Ethereum is the blockchain system which provides us more flexibility to build Smart Contract based systems. It has a broad range of development tools made by and for developers, and some of its architecture and security standards have been well defined. However, Ethereum contracts are still like legal contracts in the ancient Greek age, where humans had some “secure” and standardized contracts but when they had to write more complex contracts, lots of tricks and backdoors appeared. This sticking point for lots of developers and entrepreneurs is one of their highest pains right now. We can compare Ethereum with the Android OS. Android, for example, is really useful because it lets developers make mobile apps easily, but one of the tradeoffs for this is the security. Lots of phishing apps have been discovered, and lots of money has been lost because of this broad freedom to create mobile apps provided by Android. We also spend lots of time thinking about how to promote adoption on blockchain technology. For this to happen, we probably need some more simple applications which are more secure, so we can promote its use while developing more complex systems and testing them. Here’s where NEM kicks in. NEM was built from scratch and has been tested by many banks and big corporations. With extensive enterprise developing experience under their belts, several full-time NEM developers write and execute thousands of tests before every development cycle and release, and this gives NEM a very secure core. NEM’s approach is to let developers use a wide range of combinable functionalities which let them build powerful applications based on a closed set of atomic operations, and opens the network to almost any technological combination thanks to its REST API. Notably, mix matching and combining Namespaces (unique domains), Mosaics (customizable assets), 2.0 multisig contracts, and three forms of messaging, allows for a wide variety of application frameworks to be built. By assigning meaning to these different functions and combining these in various ways a wide range of applications are currently under development including apps for transmitting financial value, notarizations, tracking and logistics, voting, land management, ID management, and more. NEM's architecture makes it very simple for developers to build blockchain applications in almost every device with the same degree of decentralization and security. To give an example, the NEM NanoWallet can run on a desktop and smartphone without any problem and can be used as a boilerplate to build more complicated applications making customized apps built with it accessible on Windows, Mac, Linux, iOS, and Android. Another critical thing for a decentralized application is scalability. 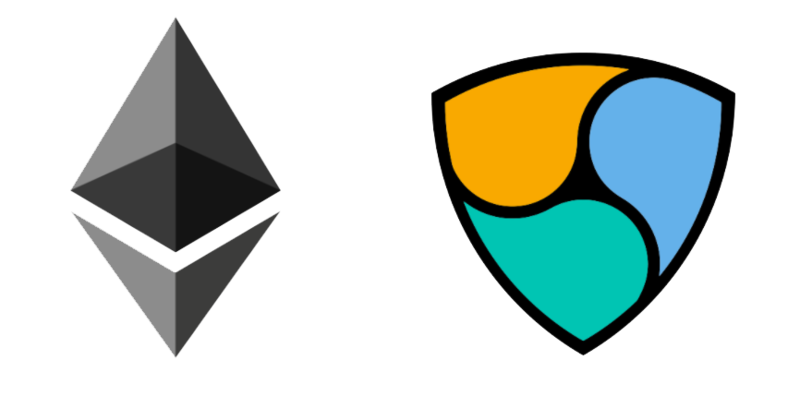 Right now, Ethereum can have at most, near 15 transactions per second, while NEM can scale to hundreds of transactions per second, and has already been tested privately and independently to scale to thousands of transactions per second in the Catapult release. Catapult is currently in a closed beta and is scheduled to go live in 2017 if all goes well. But the most important thing is the following; NEM has never had a serious security issue. The commitment of the NEM Foundation and the core developers with regards to the security and the availability of the network is of utmost importance, and this gives to the community, third-party developers, and investors a guarantee which is hard to equalize. No one doubts on the strong potential of both technologies, and right now NEM seems to be a more stable choice for building new applications which have to support real business models and do so now. Its security and development facilities can let blockchain entrepreneurs focus on relevant problems and not in technical difficulties, and its learning curve is far and away smoother than the Ethereum. NEM is great for lots and lots of applications that many people would want and it is easy to build on. Ethereum is better for very specialized projects but needs somebody who has a very high level of skill to do it exactly right. Whereas, in NEM, it’s already done for you, so you can't really hurt yourself if you go wrong. That’s why I think NEM is the obvious choice. The NEM team would like to thank Andreu Rodríguez i Donaire, the CEO at Atraura Blockchain for writing this blog.